chevybuldr has no other items for sale. Details about 1981 Dan Post Vintage Leather Cowboy Boots Ad "Smile When You Say Dan Post." 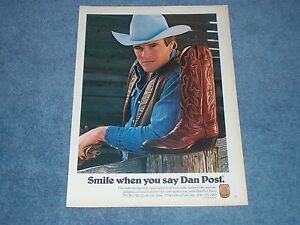 1981 Dan Post Vintage Leather Cowboy Boots Ad "Smile When You Say Dan Post."